Canadians have long been regarded as among the most intrepid of travellers, with millions heading overseas each year. While many of us flee our notorious winters for a week or two of sun, sand and theme parks, an equal number venture further afield—it doesn’t seem to matter how far we stray, we’re guaranteed to see a Maple Leaf on a backpack almost anywhere. We are true explorers. Canadians were among the first in the world to embrace ecotourism when it was born a few decades ago—and now a staple of the Canadian travel market—and are pioneers of adventure travel. We never tire of seeking new destinations to discover, of finding innovative ways to experience the world’s ancient places. There’s no shortage of rich heritage on the Cook Islands. All of which is why the Cook Islands—a spectacular adventure destination—should be on your travel bucket list. Every year more and more Canadians are discovering this ancient Polynesian archipelago that lies in the heart of the South Pacific. Though often visited in conjunction with a trip to Australia or New Zealand—it takes only slightly longer to fly from Los Angeles to the Cooks’ main island of Rarotonga as it does to fly from Vancouver to London!—the islands are absolutely a destination in their own right. The Cook Islands are comprised of 15 tropical islands set amid 2.2 million square kilometres of picture-perfect azure waters, and home to just 19,000 of the most welcoming and hospitable people on the planet. Fringed with the finest white sand and warm ocean beachfronts, shaded by swaying palms and jagged jungle-clad mountains, the islands are ringed by pristine lagoons and spectacular coral reefs—the snorkelling and diving in the Cooks is among the best in the world. 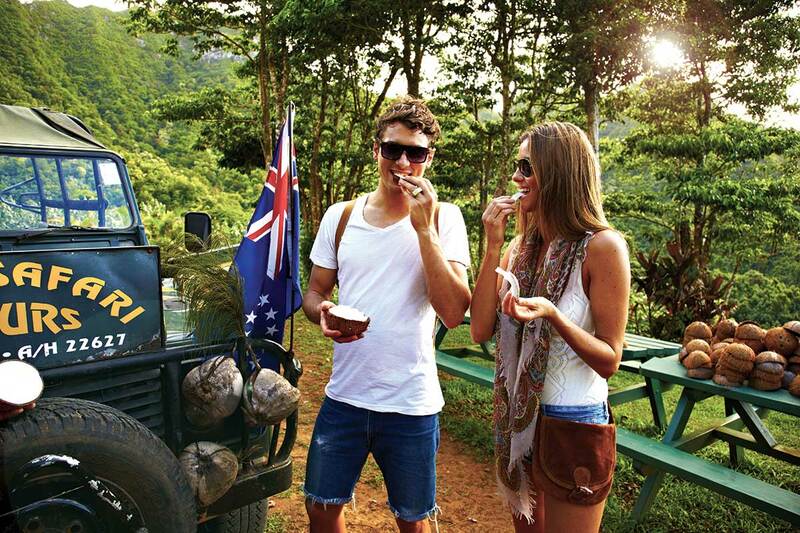 From adventure to sun-soaked inertia to exotic culture and cuisine—the choices are yours! 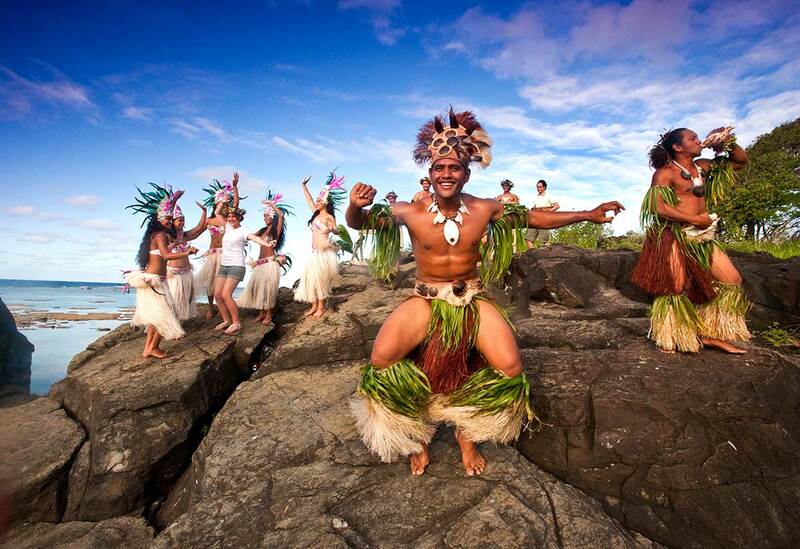 Despite the Cook Islands’ perfection, only about 100,000 people visit every year, ensuring they retain their unique identity, indigenous culture, pride and traditions, even as the people enthusiastically embrace everyone who ventures their way. In fact, the renowned warmth of the locals will stay with any visitor long after the tan has faded and the last grains of sand have slipped from between the toes! 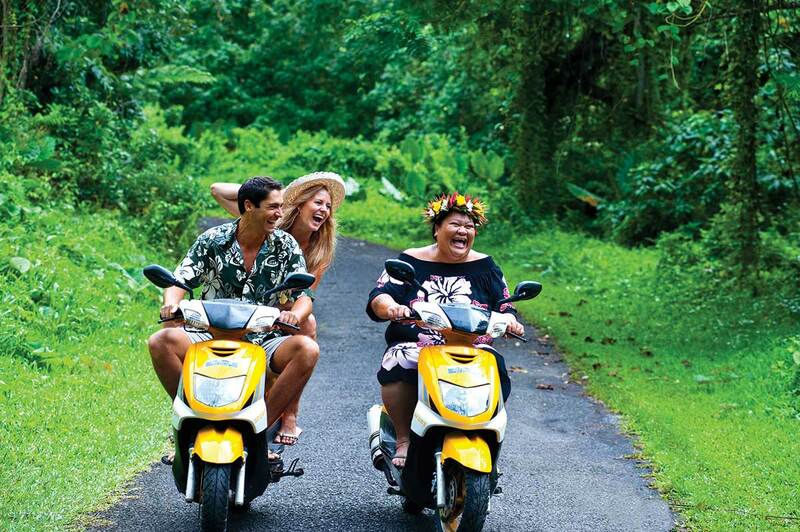 A safari drive is the best way to see the incredible wildlife diversity on the Cook Islands. Most visits to the Cooks begin in Rarotonga, home to the country’s capital and the largest and most accessible of the islands. Regular flights reach the capital from Australia, New Zealand, Tahiti and the United States, from where it’s possible to continue the journey to the smaller or more remote atolls in the chain. Or, you can just lay claim to your own little spot of paradise and set off to explore it from shore to mountain, from town to pawpaw patch. The temptation to spend your days here just lolling in a hammock with a good read may seem overwhelming—but there’s plenty to see and do if you can find the inspiration to slip your flip-flops back on your feet. If you’re feeling particularly intrepid, you could head off on the cross-island trail that passes Te Rua Manga—the island’s jagged and jutting jade pinnacle—and takes in the breathtaking views from the 340-metre-high summit of the flat-topped Mount Raemaru. You could try the trail by yourself, but a local guide will share hidden waterfalls, abundant wildlife, and perhaps even the secrets of the medicinal plants that abound in the jungle. 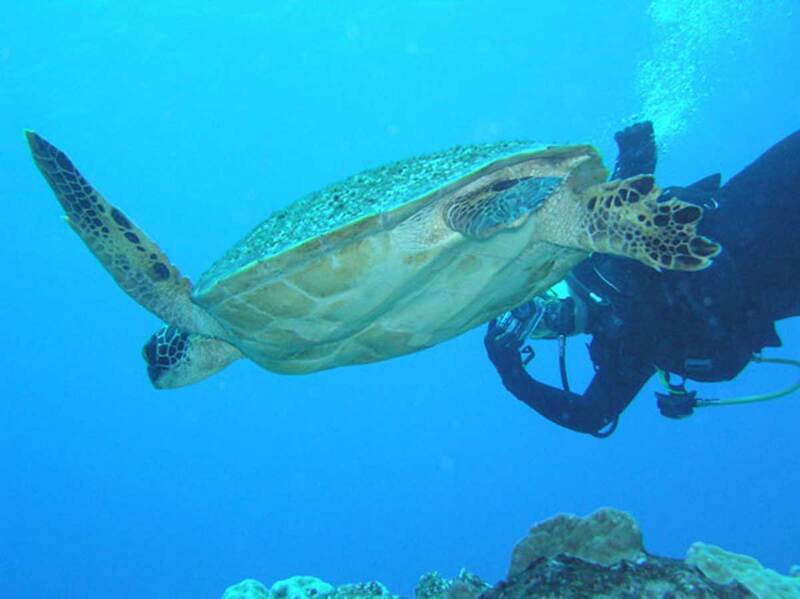 You’ll meet turtles, trigger fish and octopuses while diving around the Cook Islands. For those interested in history and culture, there’s Ara Metua, the 32-kilometre, 11th-century road that passes several sacred sites along route. Or, you can sit quietly and hope to catch a glimpse of the endangered Rarotonga monarch, a species of flycatcher so rare that any birdwatching buffs at home will be eternally jealous! If it’s the surrounding ocean that calls most loudly, the Cook Islands offer some of the world’s finest swimming, snorkelling and scuba-diving, whether from a well-known beach or a hidden pearl divulged by your new local best friend. In season, you can also head to the ocean for some whale watching, sailing, a spot of fishing, or just a visit to an uninhabited atoll. And even the shopping is fantastic—with local artwork and handicrafts, cloths and carvings valued in galleries throughout the world. Or, if you want something even more personal, how about a traditional tattoo? Composed of intricate, time-honoured designs that draw deeply from the islands’ history and which are worn by the locals with immense pride, a traditional tattoo could be the ultimate keepsake for the right traveller. From exquisite and naturally-organic fruit to mouthwatering roasted pig, local Arabica coffee to the freshest of seafood, and accommodation ranging from B&Bs to backpacker hostels, from hotels to private beachfront villas, the Cooks offer something for everyone. 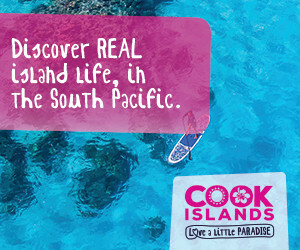 Visit the Cook Islands website to discover an entire chain of paradise to explore!